HCA207 Antigen-Capture Assay using the Adalimumab/TNFa complex binder HCA207 for detection. 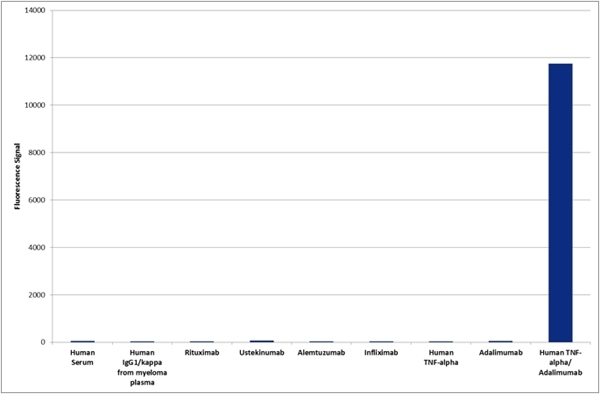 Human TNFα was used as the coating antigen followed by Adalimumab spiked into 10% human serum. Human anti-Adalimumab/TNFα antibody HCA207 (conjugated to HRP) was used as the detection reagent. Anti-adalimumab drug-target complex antibody specifically recognizes the adalimumab-TNF alpha complex exclusively and detects adalimumab or biosimilars only when bound to TNF alpha. This antibody is in full immunoglobulin format and is suitable for a PK antigen capture format assay. Human anti Adalimumab, clone AbD18754_hIgG1, is an antibody that specifically recognizes the adalimumab monoclonal antibody while complexed with TNFα. As clone AbD18754_hIgG1 is a complex-specific antibody that recognizes adalimumab bound to its target, TNFα, it does not recognize either free adalimumab or unbound TNFα. Clone AbD18754_hIgG1 can be used in assays to measure adalimumab that has been captured via immobilized TNFα. It can also be used to measure adalimumab/TNFα and biosimilar products using bioanalytical assays. 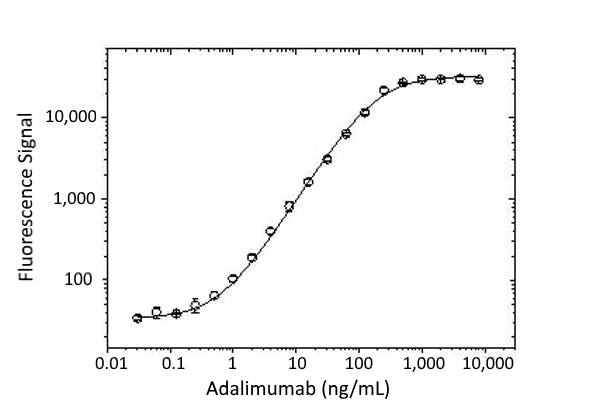 The monovalent intrinsic affinity of this antibody was measured as KD=67 nM by real time, label-free molecular interaction analysis on immobilized adalimumab/TNFα.